Little Zombies: The Son of Neptune: Yay! Percy is Back!!! The Son of Neptune: Yay! Percy is Back!!! Pricky rated it: 4 Bites and "Read it!" To storm or fire the world must fall.An oath to keep with a final breath,And foes bear arms to the Doors of Death. Percy is confused. Hazel is supposed to be dead. Frank is a klutz. 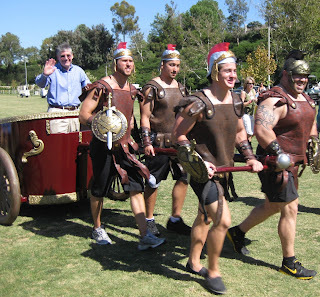 Riordan's arrival to the "Roman Camp"
The Son of Neptune is the second in his new series: The Heroes of Olympus. The first book, The Lost Hero, follows the adventures of 3 demigods: Jason, Piper, and Leo while The Son of Neptune begins at the "Roman" camp starring Percy, Hazel, and Frank. "Her Bargain Mart vest, her flowery dress, even her tusks were decorated with 50% OFF stickers. Her name badge read: Hello! My name is DIE, DEMIGOD SCUM!" The chapters switch POVs seamlessly among the 3 characters. Each has it's own mystery, strength, and weakness. And Frank's Asian grandmother was so ON THE MARK! 1) The characters all seem to have the same "voice." I'm not sure if that really makes much sense, but while each of the characters have different backgrounds, they seemed to speak the same, have the same humor. It's not enough for a reader to notice unless there are being overly Type A...like me. 2) Definitely try to read the books without waiting MONTHS in between. It made for a frustrating read as I was trying to pull my amnesia back into remission. There are A LOT of tiny references to both Book 1 and The Lightening Thief series--not enough to take away from the story, but it would have been nice if my memory served me better. Alas...Signing my book but talking to another reader. I highly recommend any of Riordan's books. The only bummer about finding an author you enjoy is that you're not the only one; Riordan's last book signing was INSANE and a bit of a disappointment. I literally was given less than 10 seconds to say hello and have him sign my book. Oh, wait, I didn't even get a chance to say hello because he was busy talking to the kid in front of me. I got a "head nod" and then herded out of line. Apparently, I haven't gotten over that. But still, go read the book. It was funny fun. 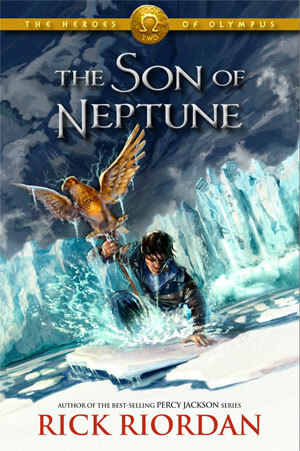 Purchase The Son of Neptune on Amazon here. Olivia Bean, Trivia Queen: What is...Jeopardy?